Every cancer survivor wants to know which diet will help them feel better and reduce their risk of recurrence. 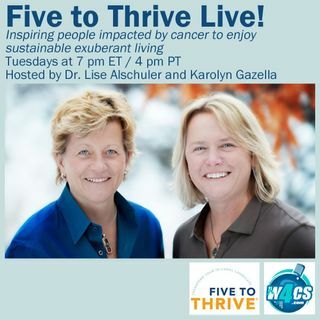 On this episode, Lise and Karolyn will discuss a variety of diets and then give you their bottom line based on the scientific literature. Listeners will learn about low-carb, caloric restriction, ketogenic, DASH, and the Mediterranean. If you are thinking about changing your diet, you won't want to miss this show! It will be packed with practical information you can use ... See More immediately.